These are guided meditations that are journeys of the mind. 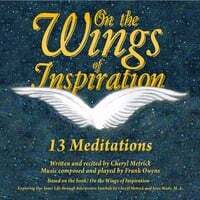 Written and recited by Cheryl Metrick. Music composed and played by Frank Owens. The book is based on a collection of Cheryl’s drawings and poems. The premise of the book is to not only explore the interpretation of the art itself, but to journey into the drawings to find more personal meaning within. There is a guided process to lead the readers to take their own inner journeys for self-awareness and inner growth. THERE ARE ANGELS won 9th place in the Country genre of the 2010 Indie International Songwriting Contest. I usually enter this song under Country, Adult Contemporary, Adult Pop, Contemporary Christian, or Inspirational when available. 1st click on WINNERS, scroll down to my song...click on my name...click on LISTEN on the left, and you can hear the entire song. Trailer for HIGH HOPES television pilot written by Dennis Cabrini who also has the lead role. I play Cheryl DiBiase, the landlord's wife. The Legendary Frank Owens: my accompanist, my music director, my mentor, my dear friend.